Tag line: "A story of triumph"
After making his feature film debut in 1976 with Bugsy Malone, a kid-centric musical comedy in which child gangsters shoot each other with whipped cream machine guns, director Alan Parker did a complete 180 and followed it up with 1978’s Midnight Express, a searing drama about a young American serving time in a Turkish prison, where he’s subjected to the worst kind of treatment imaginable. As a one-two punch on a director’s filmography, it doesn’t get more different that that! 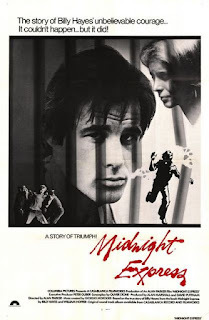 Inspired by a true story, Midnight Express introduces us to Billy Hayes (Brad Davis), a twentysomething American who, in 1970, was arrested at the airport in Istanbul for trying to smuggle two kilos of hashish out of the country. Sentenced to Sağmalcılar Prison, he soon befriends other westerners, including Jimmy (Randy Quaid), Max (John Hurt), and Erich (Norbert Weisser). They tell Billy not to trust anyone, especially fellow prisoner Rifki (Paolo Bonacelli), who receives money from the brutal warden Hamidou (Paul L. Smith) in exchange for information. At his trial, with his father (Mike Kellin) by his side, Billy Is given 4 years for possession and immediately returned to Sağmalcılar to begin serving his sentence. While the prospect of spending 4 years behind bars in Turkey isn’t an attractive one, Billy’s father reminds him it could have been worse (the prosecutor was pushing for a life sentence, the penalty for smuggling). Heeding his father’s advice to keep his head down and obey the rules, Billy is, in many ways, a model prisoner. Then the unthinkable happens: with only 54 days remaining on his sentence, Billy is re-tried (at the prosecutor’s insistence) and given an additional 30 years! Now at his wit’s end, Billy joins Jimmy and Max in a failed escape attempt, and even does time in the camp’s sanitarium, where he slowly begins to unravel. Billy’s longtime girlfriend Susan (Irene Miracle) urges him to try another escape and, if possible, cross the border into Greece. But with his mind in a shambles, it’s looking more likely that Billy will die in prison long before he’s ever a free man again. Brad Davis is nothing short of remarkable as Billy, delivering a performance that is both powerful and heartbreaking (particularly in the later scenes, when his sanity starts to slip away); and the supporting cast is exceptional, especially John Hurt (as the drug-addicted Max), Randy Quaid (playing the only other American in the prison), and Paul L. Smith (like Billy and the others, we come to loathe warden Hamidou, whose chosen form of torture is to smack prisoners on the soles of their feet with a club). Also standing tall are director Alan Parker and screenwriter Oliver Stone, who manage to generate what at times is an unbearable level of tension. The opening sequence with Billy at the airport is nerve-racking (his trip through the security line is accentuated by the sound of his beating heart, which gets faster each time he’s in danger of being found out); and many of the prison scenes are hard to watch (the most disturbing comes late in the film, when Billy, in a fit of rage, violently attacks a fellow prisoner). All this, combined with its realistic setting (the movie was shot on the island of Malta, with a military fort that dates back to the 14th century standing in for the prison) helps transform Midnight Express into a harrowing motion picture experience. The film has been criticized over the years for its inaccuracies (the ending differs greatly from what actually occurred) and anti-Turk sentiment (in 2007, the real Billy Hayes apologized to the Turkish people for how his book, and subsequently this film, portrayed them), and while these accusations do have some merit (the movie’s negative portrayal of Turks does go a bit far), they don’t detract from its overall power. Tough and unflinching, Midnight Express hits you like a punch to the gut, and it will take you some time to recover from it. .